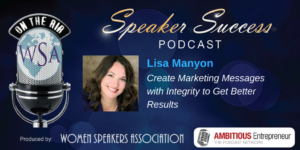 In this Speaker Success Podcast I share tips to create marketing messages with integrity. If you can talk, you can write. Interestingly enough many of us have to hone our skills in both areas to get to the point where we are comfortable on stage and on paper. Host Anne Marie Cross skillfully hosts the Women Speakers Association Speaker Success Podcast on the Ambitious Entrepreneur Podcast Network. Tune in and then share your biggest takeaways on the show notes page here. 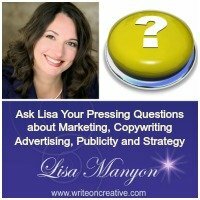 The importance of energetics in marketing and why COPY is queen (think feminine energy) and STRATEGY is king (think masculine energy) – just like a relationship, they must work together to get results. Here’s the link to access the podcast. Be sure to leave a comment after you’ve listened. We always love to hear your takeaways and comments. You can claim your Speaker Success Plan via Women Speakers Association on this page, too. I highly recommend the Women Speakers Association and am honored to have served on the Leadership Team since inception. This entry was posted in Resources and Interviews	on Sunday	March 19, 2018 at 6:08 pm. You can follow any responses to this entry through the RSS2.0 feed. You can also leave a response.